HR departments are undergoing a transition – one that aims to offer people the best possible workplace experience. Fifty-six percent of respondents in the Deloitte 2017 Global Human Capital Trends survey are redesigning their HR programs for digital and mobile tools. Thirty-three percent of HR teams are using some form of artificial intelligence (AI) tools to deliver HR processes, and 41 percent are actively building mobile apps to deliver HR services. engages them with right opportunities. If your employees are not motivated, their tenure is at stake. About Forty percent of workers said they left a company because they lacked access to state-of-the-art digital tools and 58% said they need to work elsewhere to gain digital skills. The benefits of automation with AI are more than efficiency. You also improve the user experience for your prospective hires, employees, managers, and the HR team. Let’s take a look at some of the solutions being used in today’s leading organizations. AI will be the game-changer in the HR industry, handling many routine tasks with efficiency and speed. 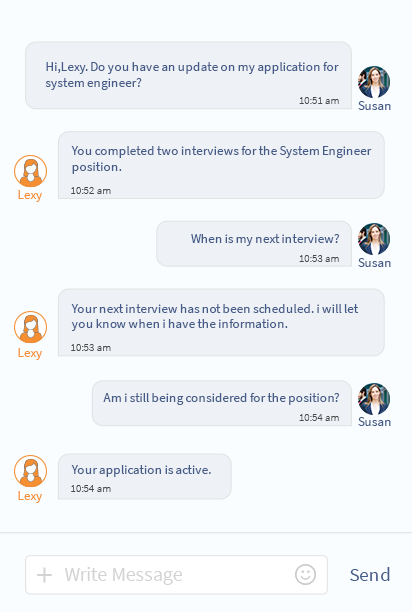 73% of HR professionals agree that chatbots will be an important interface to provide real-time answers for employees, and 39% of professionals feel they will use AI at a high degree by 2022. Screening stacks of resumes to find the right ones, finalizing them, and analyzing their behavior during interviews are some tasks that grab a lot of your time. AI can analyze candidate profiles much faster than humans, and they are more accurate. Algorithms can capture the emotional intelligence of your candidates using facial recognition and neuro-linguistic programming. You can also get rid of 'unconscious bias', a common human mistake in hiring. Employee engagement is critical. Employees who are engaged are 27% more likely to report “excellent” performance. Traditional surveys and one-to-one conversations to fix engagement issues will take up a lot of your time and give you meager results. AI based chatbots and messaging platforms can communicate with and engage your employees. They can interact, capture emotions, and help you identify if any of your employees are disengaged. Your managers need accurate data to plan employee development. Some of the ways you can do this is through assessments, conversations with employees and managers, and reviewing the training strategies available. Then you must analyze all the data you have in your hand. AI embedded into your L&D processes can offer personal training recommendations and support development plans. With AI, you can engage your people and prospects with accurate information, ease communication, enhance your hiring efficiency, make training recommendations for your people, and capture emotions to identify those disengaged at work. Make artificial intelligence your helping hand for managing your routine workload, so you can focus on the human side of things.